নতুন নরমের কোলে, ফিরে পাওয়া মৃত্তিকায় উঠে কতক্ষণ অজ্ঞান ছিলাম আমি? নাকি কতদিন? জানিনা। আমার কালবোধি লুপ্ত হয়ে যায়। জ্ঞানের সাথে ফিরে আসে খিদে – তীব্র, তামসিক প্রদেশ থেকে বেরিয়ে আসা এক উদগ্র খিদে। আর তার সাথে আরো অনেকানেক লুপ্ত জ্ঞান। প্রমোদতরীর নাম মনে ছিলো না। তার ভেঙে পড়ার সময় ও স্মৃতি। ডুবের যাবার অনুভূতি, যে জল জলদস্যু, তার সাথে সংগ্রামের উপাখ্যান আজও মনে পড়েনি। নবজন্মের ভেজা গায়ে শুয়ে শুয়ে দেখলাম দিকশূন্য নীলাকাশ। ঘাড় ঘুরিয়ে দেখলাম ভেজা মাটি, কর্দমাক্ত প্রেম; লিরিকের শূন্য শূন্য সব দিকবিদিক। তারপর কোনো রকমে উঠে দাঁড়িয়ে পায়ের ব্যবহার পেলাম। যেন এই প্রথম। দূরে তাকিয়ে দেখলাম আরো কয়েকটা দ্বীপ। মনে এসে গেলো ‘দ্বীপ’ শব্দটা। মনে পড়লো ভাষা, বাংলা, জ্ঞান, বিজ্ঞান, সঙ্গীত, গণিত। মনে পড়লো কত কবিতা। আদুর, অবোধ বাংলা ভাষায় লেখা। এ সবই হয়তো আমার কবিতা। বুঝতে পারলাম আমি কবিতা লিখতাম, বাংলা জানি, শুধু জানিনা আমি কে। আমি কোথায়? আমি কেন? ""...the dark will not pray for us// The dark will be a ground we recover in the night/Illegitimate, turning to those other bodies//Those others who are the only spirit, the only health/We will have known, going back to them like conditions"
A new cine-essay just came out in Moria Poetry. Wonder if the poem-film inspired by Memories of Underdevelopment (MOU) will at all progress. The muse seems to have left. Memorandum of Understanding (MOU) is the title of our poem. I recently got deeply interested in the life and paintings of Frida Kahlo, the 20th century Mexican Renaissance painter. Of course it was the movie "Frida" to begin with. Julie Taymor's (and Salma Hayek's) 2002 movie did one good thing above all, it breathed life back into Mexican cultural history of the last century, especially painting. I knew nothing about Frida before I watched this film. And after I did, Frida was all over me. I saw another documentary film about Frida Kahlo and her times. Carlos Fuentes, the famous Mexican author, was one of the commentators. It is a platitude now that Frida's work is inseparable from the life she led. Nearly every painting she did, seems to have been drawn with her fragile yet compelling sexuality, with the real blood she spilled all along her walks and the ill-fate that walked with her - all seem to serve as the corolla from which her painting swirls out. The one interesting aspect of Frida's painting is "surrealism". Let me self-reflect a little bit on this today. Frida's painting was considered to be "vaguely surrealistic" much like the way South-Asian English accent would seem to many Westerners as "vaguely British". Andre Breton, the theorist behind the French Surrealistic movement, went to Mexico City and met Frida and her lover/husband, the noted painter Diego Rivera. Breton did see a bold new brand of "surrealism" in Frida Kahlo (maybe much like the way Marc Chagall, the German painter, saw "Modern Expressionism" in Tagore's paintings and urged him to join their movement). While Tagore denied outright to sign up for the brand, I thought, Frida was sort of hesitant initially. She agreed to latch onto the "brandname" in some vague way. Later Breton invited her to display her paintings in Paris. Nothing had been arranged for her when she landed in Paris. 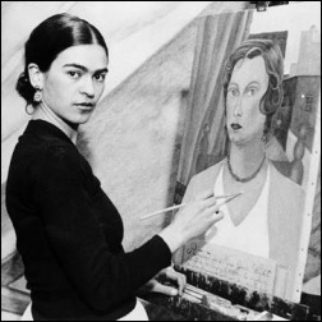 It left her sour-lipped for a while; finally a show could be arranged and Frida sold well. At this point in the video, Carlos Fuentes makes a comment which got me thoroughly enthused over this quality of Frida's work and Latin American culture in general. Fuentes said, that to the Americas, Surrealism was a part of life way before the French invented it. Surrealism was not something that had to be extracted from a dream, it was part of the common Latin thought-process, part of common Latin life. With the new-found freedom, Frida's paintings just expressed it boldly. I am deeply curious about the statement Fuentes made and am trying to understand it better. I'll add notes to this posting when I get more meat to bite on. mUl lekhaaTaa 13th Dec, 2005-er. Sandipan er mRityur khabar peye. Sandipan-er sange pratham dekhaa hay 1991. sheshhabaar 2002-er baimelaay.